These were the lyrics I played over and over on my shuffle and in my head for the last 8 miles or so and in review they fit so perfectly well with the rhythm of my race, or at least that’s how I thought it played out – my splits could say otherwise. I can honestly say I am proud of myself for this performance – it has been a trying past few months, but somehow I managed to keep it together. Today I ran smart – not too fast, but good enough to enjoy this incredibly beautiful and challenging course AND take the top third spot and F1. The course was gorgeous, the aid was perfect and I got really teary-eyed near the finish because I have the privilege to run and race with such good friends. So proud of everyone today, definitely a special day! 8:26:35. 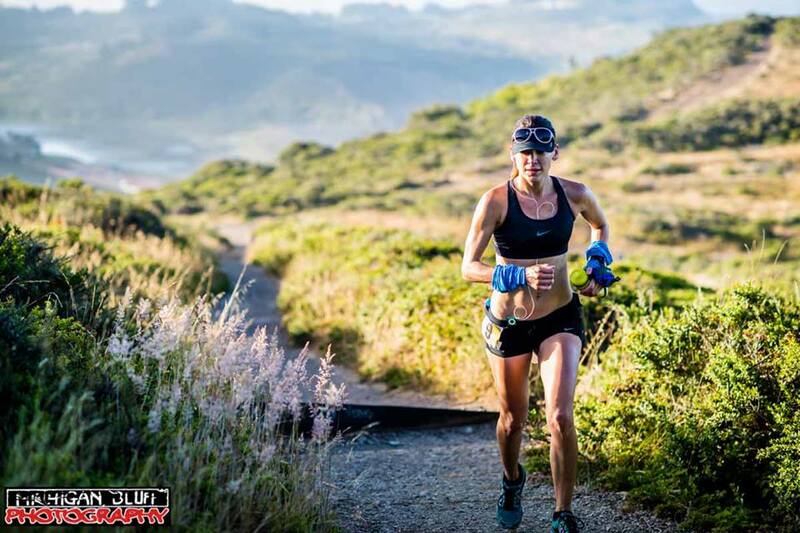 Gorgeous course all over Marin Headlands (SF) starting and finishing under the Golden Gate Bridge and then running through and around Rodeo Beach, Tennessee Valley and Muir Beach. Views were breathtaking (for me anyway), overlooking the beach from some pretty gnarly hills. With an elevation gain of 10,000+ feet, I really expected it to be a long, hot, 9.5 hour day and I was content with that. My plan was simple, run fast enough to be the first woman, but not so fast that I might injure myself (thinking of the big picture marathon). I was really hoping for a top ten overall finish and I ended up placing 9th! I was extremely worried about getting off course since we would be going in and out of Tennessee Valley from a few directions. I did, only once right before mile 20 and instead of turning right on Miwok, I headed left back up a trail that we had already came down earlier. Common sense told me I shouldn’t be heading in that direction and since I could no long hear the voices of the guys that were in front of me, I got back on the trail and found the pink ribbon that should have taken me right instead of left. Not sure how much more I added to my milege — not a big deal. The race was officially 49.3 miles and my Garmin died with 48.99 miles on it, 7.5 minutes before I crossed the finish line. I guess I could do the math if I wanted to. Garmin details HERE. Aid stations were fully stocked with a huge variety of items. I managed to get 90% of my nutrition (240+ calories per hour) from my own stash of FRS energy shots. I am really tired of gels and these remind me of concentrated orange juice that can be taken as a shot, or poured into a water bottle. Each shot is approximately 120 calories, 35mg of caffeine, and just…YUMMY. ONE thing I didn’t like was the packaging – the wrapper is hard to remove when you are running/hiking and then screwing off the cap is difficult; the hard little bottle makes it hard to carry more than a few at a time if you are carrying handhelds instead of a pack. *FRS website seems to be discontinuing this size and is instead offering a 16 serving size bottle (maybe for the reasons I just mentioned). I purchased mine on ebay, buy one case, get one for free so I doubt I will find another deal like this. By far my new favorite product that I don’t want to be without — a must-have! Inside Trail hosted this event and had some really great swag. Coming in as the first Female earned me a new Suunto Ambit GPS watch with heart rate monitor, $250 in prize money and a few other things like an embroidered blanket and personalized beer mug. I was really excited about this since I have never really won anything before, plus I felt like I had to work pretty hard to earn it. Complaints? None, really. I would suggest that the race have water available in the morning at the start line. I never come to a race with an empty bottle or pack but I did on this day and got lucky to have a bottle in my car. Other than that, everything was great and I would love to do more of their races. One of the best parts of this event was the people. I had a blast traveling up with my coach Andy Noise (who did the 50K), allowing us to catch up and get to know each other better. I was also able to run with Mark Tanaka — this man heavily influenced and inspired me through my journey at Javelina in October. He has a lot of races under his belt and I think I could learn a lot from him. We ran together for quite a long time and only finished about 6 minutes apart. Then there was Chris B. who I ran into during the race, it turns out were were DM friends already but just never met. That was cool. 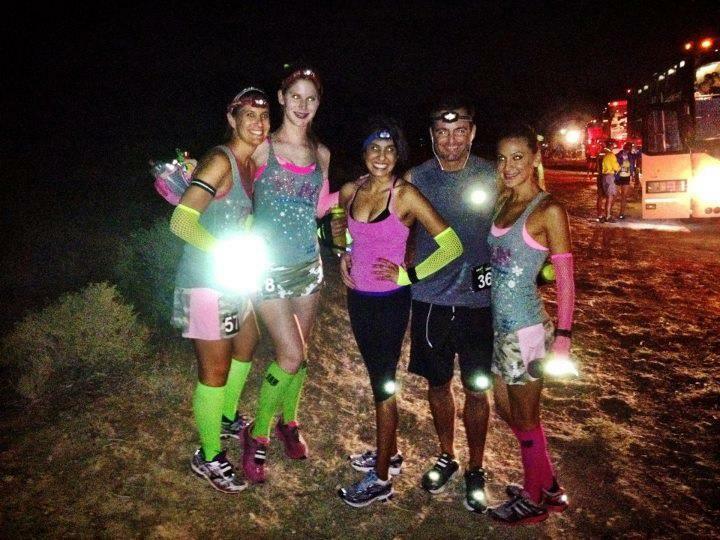 It took me exactly four days to get back on my running feet following the wonderful San Juan 50k. I was pretty wrecked post-race after taking another few spills in the first half of the race. It wasn’t all the missing skin that concerned me but my poor knee, both times I managed to bang my left knee which was the one I had been complaining about for the last month. Luckily, the running Gods are once again on my side and everything seems to be back to normal (less the missing skin). San Juan 50k was a great last minute race decision as I found myself very anxious for Leona Divide coming up at the end of April; it would be a great opportunity for me to log some long miles on a course I had recently become fond of. 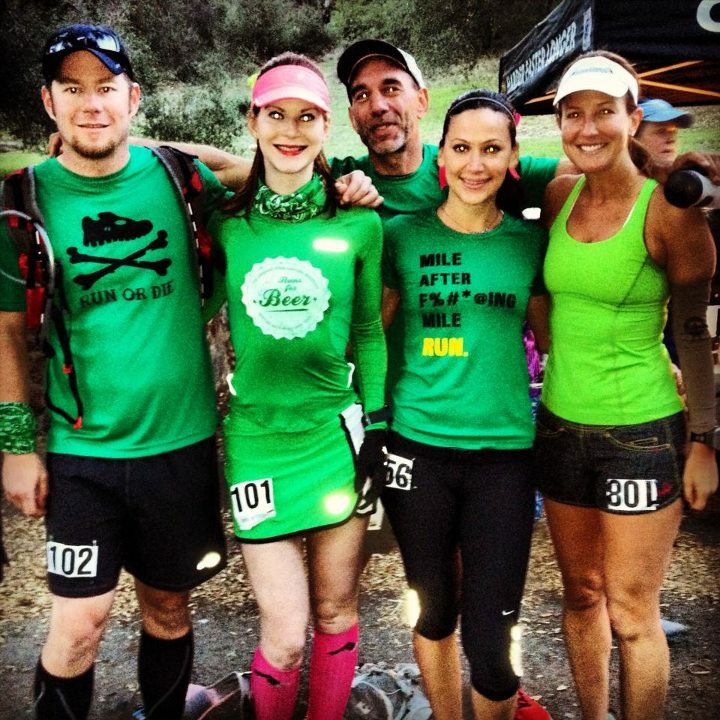 I was also very excited that my friends would be proudly supporting Runner’s Booty by each wearing a green themed tech top. Signing up for the race, my intention was to use it as a long training until Andy told me that if my body felt good, I should use it to gauge myself for next month’s race. Of course this excited me because no matter how many times I try to convince myself or my coach that I will just “jog” or “take it easy,” race-mode automatically gets turned on and I can’t even stop myself from running through the bad kind of pain. I know that is horrible…I am trying to work on that. If I could sum up how I feel about my first 50-miler — the experience, my results, I’d still use the word: HAPPY. Unlike past racing seasons where I’d race shorter distances much more often, it felt like I hadn’t raced forever. I was nervous, anxious and excited. I couldn’t wait to get to that starting line and experience another NEW race distance at another NEW place. 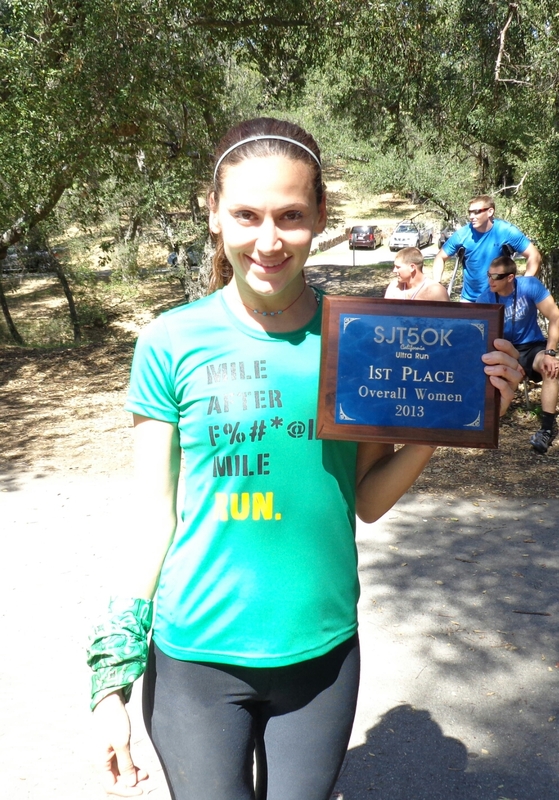 Avalon had also held a special place in my heart because it was about a year ago that I started putting Runner’s Booty together and a year ago I debuted a few tank tops at this race. Ash had strongly suggested I run this race because she thought it was very similar to El Moro, a local trail that we hit up on occasion. She also thought I could be a top finisher (I think she is my biggest fan, haha). I really feel like I headed into this race with positive attitude. Yes, I was a little worried and I had a lot of questions about the race and myself but I don’t think that was a negative thing…I’d like to say I am realistic. 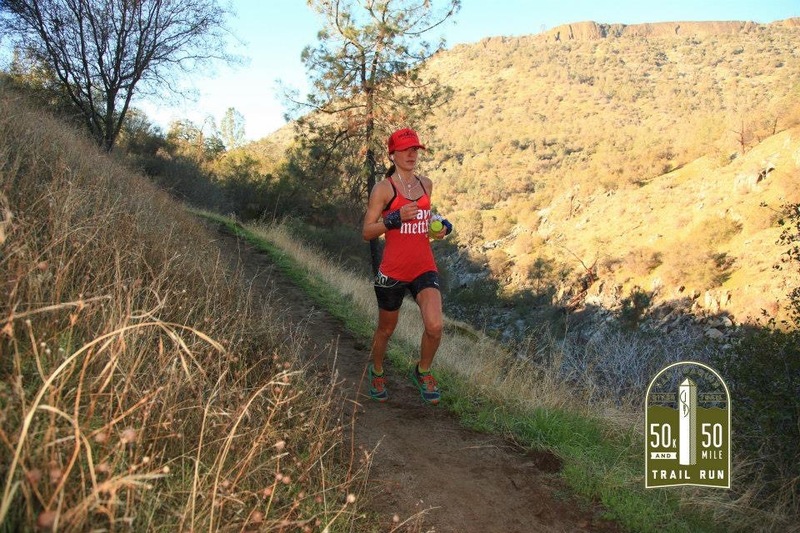 And I felt like my experiences at Javelina had carried me to the starting line — both the lows from all the pain and having to drop out (and being OK with it), to the highs of finding out I had set a new course record for the default 100k finish.